If you become a full-time RV’er, there are a lot of insurance coverage which is normally covered under your homeowner’s insurance plan. You need to get some additional protection which won’t be covered under a standard RV policy. A full-time RV insurance policy is going to be very similar to a homeowner’s insurance policy. Regardless of what you consider “home,” you need to make sure it’s covered. 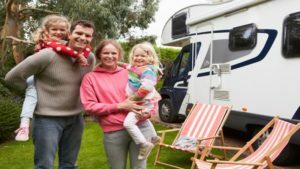 Let’s look at some of the important parts of an RV insurance plan. Maybe you want to travel to see friends or family while you’re riding around in your RV. Maybe you’re meeting some new friends, who knows. But regardless of who will be coming in and out of your RV, you need liability coverage. If someone were leaving your RV, and they tripped down the steps, they could seriously hurt themselves. This is why liability insurance is important. If you’re held responsible for any injuries or damages, the other person can legally sue you. Your personal liability can offset those expenses. Depending on the carrier, you can get up to a million dollars in liability protection. As a part of liability, you’ll also need some coverage for medical bills. If your family member or friend hurt themselves while they were on your RV, or the property around your RV, you would be responsible for paying those hospital fees (depending on the situation). Similarly, if you’re driving down the road, and you have a wreck, this coverage can pay for any medical fees because of the driving accident. Depending on the plan and the insurance carrier, you can get $5,000 per person for medical bills. Some carriers offer more, but you want to ensure you have at least this much protection. If you live in your RV, then just about everything you own (or just about) is on your RV. What if something awful were to happen? Theft or damages. If you have the proper RV insurance policy in place, your plan should help you replace some of your things. Just like with a homeowner’s insurance plan, the amount of coverage you get can vary depending on the policy. Whenever you’re on the road, you never know what’s going to happen. You can drive as carefully as possible, but anything could happen. If something awful were to happen, and you ended up totaling your RV, you’re going to need a good insurance policy to replace your RV. This is one of the most important parts of any RV insurance policy. This RV is more than just your vacation spot, it’s your home. If you were ever in a wreck, what would you do? You need to have the insurance plan in place to get another RV and get back on the road. When you’re looking to go full time with your RV, there are a lot of factors you’ll need to consider. IT can be a frustrating transition. If you’re in the Denver, Colorado area, and you want to gas up your RV and hit the road, give one of our agents at Longevity Brokers a call. Unlike some insurance agents you’ve worked with in the past, we aren’t captured agents, meaning we aren’t tied to a single carrier. Instead, we have built partnerships with a variety of carriers, some big, some small. What does this mean to you? It means we can do all of the shopping and comparing. Instead of you having to call a variety of different companies, we can do it for you. We know which companies have the best plans for RV owners. Also, if you have questions about your RV protection, let us know. We have years of experience in the insurance industry. Use our contact page or call us at (720) 209-4598. ← Does Homeowner’s Insurance Cover Hail Damage?